Once most wanted video converters are not needed any more. It’s because of any Video Players like VLC plays almost any video formats. Smartphones like iPhone and Android also has the best video players to support any video formats to watch your favorite movies. Although the movies are not fit into the screen of your handheld device and takes most of the memory. It’s somewhat discomfort when you watch your favorite TV shows and Videos in your mobile. To fix those problems, once again you need best video converters to convert those videos to fit in to your ,iPod, iPhone, iPad and Android Phones screen size. There are plenty of video converters available to choose for you to covert your videos to any mobile device formats. Most of this free Video converter applications aren’t support most of the formats in their free version and also they install the bloated Adware in your system. After much analysis and review, I’ve brought you “HandBrake”, the best free Video converter, supports Windows, Mac, Linux. 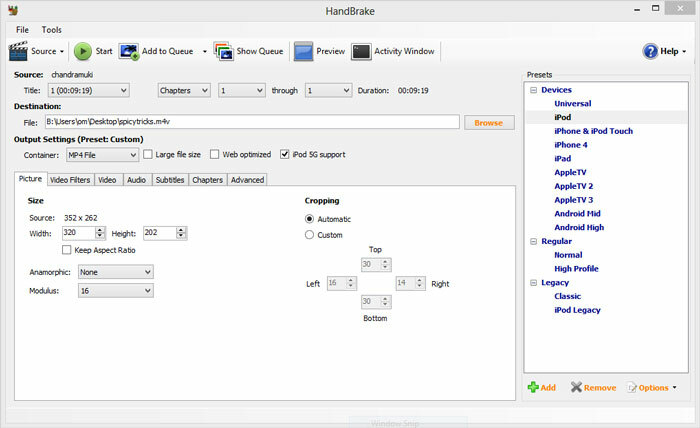 HandBrake is one of the most popular video conversion tool. It is an open-source, GPL-licensed, multi platform, multithreaded video transcoder. By using this you can rip and convert video files to work on a number of supported devices. HandBrake supports most common multimedia files and any DVD or Bluray sources which does not come with copy protection. Using the Handbrake Ripping feature, you convert any physical DVD to any Movie file format to watch on your phone. Unlike other application, the User Interface of this free video converter is looks pretty clear. All the advanced and basic features are there in the single window, so it will satisfy any basic to advanced user. 1. Download and install this application. The file size is small, and it won’t install any adware, toolbars like other free video converters. 2. Next select your desired device such as Android, iPhone or Apple TV and choose the appropriate conversion settings in the application. 3. Once you are ready, hit the start button. The Handbrake will convert your videos to your desire format, and you can get it in the destination folder, You have set before. 4. Now Copy or transfer your Video files to your Smartphone using Wi-Fi (If Android). Supports : Windows XP, Windows 7, Windows 8, Mac and Linux.